One family participated in many historic and breathtaking moments of the Civil War. Its members helped Abraham Lincoln get elected twice to the presidency. On behalf of Lincoln, the elder statesman of the family apparently offered command of the Union Army to Robert E. Lee in 1861. In 1865, that same Washington elder statesman tried to negotiate a peace settlement with his longtime friend Jefferson Davis. 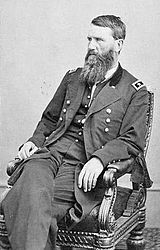 One son served in Lincoln’s Cabinet, had his house burned to the ground by Gen. Jubal Early’s Confederate forces and resigned his high government post in a sort of political trade. Another son served in Congress, became a general in the Union Army and then a senator after the war and led a life of brawling adventure. The family name still causes tourists to stop in awe and respect just one block from the White House, inside the nation’s Capitol and in front of a handsome bust in Vicksburg, Miss. The Blairs of Virginia, Kentucky, Missouri, Maryland and the District of Columbia played a uniquely influential role in American politics from the time Francis P. Blair Sr. became involved in the financial Panic of 1819 until the end of son Frank Blair’s Senate term in 1873. Francis Preston Blair Sr. (1791-1876) began a long and distinguished career of semigovernment service and influence during the 1819 crisis. He led the Relief Party and became an influential writer of newspaper opinion pieces on politics. His articles and support for Andrew Jackson so impressed the new president that Jackson urged Blair to move from Kentucky to Washington to become a full-time newspaperman. In 1830, Blair established the Washington Globe, a party organ, and also published the Congressional Globe. He gained national importance as a political journalist and ran the printing business for Congress. However, he is remembered best as the leader of Andrew Jackson’s “kitchen cabinet. Blair continued to run and edit his newspaper throughout the presidencies of Jackson and Martin Van Buren. When James K. Polk was elected president in 1844, Blair excused himself from the newspaper business but not from his role as an influencer of government policy. He traveled all the way to Jackson’s home, the Hermitage, in Tennessee to visit the former president. Blair supported John C. Fremont’s 1856 Republican presidential nomination even after he “retired” to his 20-room mansion, Silver Spring, in Maryland. President Lincoln was a frequent guest at Blair’s Maryland home, where Blair and his family entertained and persuaded the president. Montgomery Blair (1813-1883) graduated from the U.S. Military Academy at West Point in 1835. He saw action in the Seminole War, established himself as a lawyer and served as mayor of St. Louis (1842-1843). He moved to the nation’s capital in 1852. His family established residence at the town home (now called Blair House) owned by his father on Pennsylvania Avenue near the White House. He was U.S. solicitor in the Court of Claims from 1855 to 1858. He and associate George T. Curtis served as counsel for the plaintiff in the Dred Scott case of 1857. Scott and his wife sued in federal court for their freedom after their master moved them to Missouri, a free territory. Blair and his partner represented Scott before the Supreme Court but lost the case when Justice Roger Taney ruled that a slave’s status did not change when he moved from territory to territory. Taney held that Dred Scott, a slave, was property. Thus, Scott was not a man and had no standing in federal court. A fervent opponent of slavery, Montgomery Blair joined the new Republican Party. 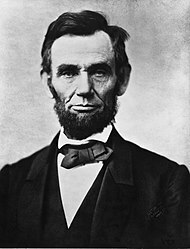 He became an ardent supporter of Abraham Lincoln for president. In 1861, Lincoln appointed him postmaster general, but Blair’s influence far exceeded the standard definition of that office. Described as the most learned man in Lincoln’s Cabinet, Blair is credited by most with founding the Universal Postal Union, an international agreement that standardized postal rates and services. He also originated prepaid postage, free mail delivery in cities, money orders, and postal railroad cars. Montgomery Blair became a key Lincoln confidant and leader of Lincoln’s kitchen cabinet. In 1861, he was the only Cabinet member who urged Lincoln to reinforce Fort Sumter, a subject far afield of his duties as postmaster. During the war, Montgomery Blair and his father frequently had the president’s ear. When Gen. Jubal Early and his Confederate army invaded the North to pressure Washington in 1864, his troops sacked and burned Falkland, Montgomery Blair’s rural retreat in what is now Silver Spring. In May 1864, a convention of Radical Republicans selected John C. “Pathfinder” Fremont as their candidate for president. 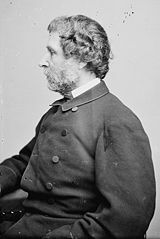 Fremont accepted the nomination and told the audience: “Today we have in this country the abuses of a military dictation without its unity of action and vigor of execution.” Lincoln wanted Fremont out of the race. Fremont demanded the resignation of the man who had urged Lincoln to make Fremont a general earlier in the war, Montgomery Blair, who was disliked by Radical Republicans. After the Civil War, Montgomery Blair rebuilt Falkland, which Early’s raiders had burned. He became active in Maryland politics and practiced law with his son, Woodbury. 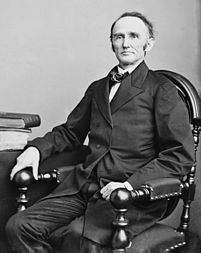 After Montgomery Blair died, Woodbury continued the law practice with his brothers Gist and Montgomery Jr.
Montgomery Blair High School in Silver Spring is named for him. Francis P. Blair Jr. (1821-1875), the younger of Francis P. Blair Sr.’s two sons, was commonly known as Frank. A lawyer, Civil War general, attorney general of the Territory of New Mexico, member of the Missouri Legislature and the U.S. House of Representatives, he spent his final time in public life in the U.S. Senate. He probably drank too much alcohol, used too much tobacco and too quickly let his anger get the best of him. Yet he was a Lincoln man, a dedicated Union man and perhaps the best of Lincoln’s politically appointed generals. Frank Blair certainly earned the right to be called the most colorful of the amazing Blairs. He exhibited his rambunctious nature at college. A professor at Yale said Frank gave him more trouble than all the other scholars combined. Frank also attended the University of North Carolina before ending up at Princeton. As a member of the House of Representatives, Frank Blair generally defended Lincoln’s policies. Nevertheless, the Blairs and the president were not in complete agreement on the question of slavery. Every man in the Blair family, it seemed, favored separation of the races through the colonization of American blacks abroad. Blair hoped colonization would serve to avoid present and future racial disharmony. Blair pushed a bill through the House that authorized the president to spend $100,000 for colonizing the freedmen of the District. The Blair family made several efforts to persuade Lincoln to make Frank a general, but at first the president put them off. Finally, in the autumn of 1862, after Frank had raised five regiments of troops and said he hoped to raise two or three more, the president made Blair a general in the Union Army. A bust of Frank Blair causes visitors to marvel at Vicksburg. A statue of him campaigning in St. Louis entertains tourists in Missouri. Both were created with family money. In Statuary Hall within the U.S. Capitol, Frank Blair’s larger-than-life statue represents his state of Missouri along with a statue of Thomas Hart Benton. The term “larger than life” perfectly describes the Blair family. • John E. Carey is a frequent contributor to The Washington Times. This entry was posted on August 30, 2008 at 12:54 pm and is filed under Abraham Lincoln, America, Blair, Capitol, Civil War, Congress, Fort Sumter, Francis Preston Blair, history, John C. Fremont, John Rives, Jubal Early, Lincoln, Martin van Buren, Montgomery Blair, Relief party, Robert E. Lee, Silver Spring, United States, Vicksburg, White House. You can follow any responses to this entry through the RSS 2.0 feed. You can leave a response, or trackback from your own site.